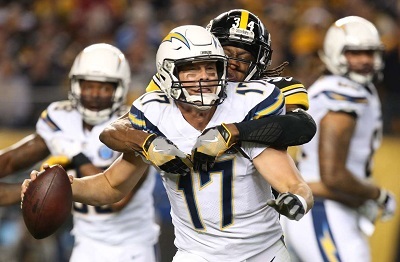 The Steelers pretty much blew their last realistic chance at earning one of the AFC’s top seeds and the accompanying bye with their late implosion in a 33-30 loss to the Chargers at Heinz Field on Sunday night. With a month to go in the season, the Steelers (7-4-1) trail both the Texans (9-3) and Patriots (9-3) in the race for at least the number two seed (I think it’s safe to forget about the top overall seed, what with the Chiefs (10-2) showing no real signs of slowing down). Pittsburgh is reeling a bit after two-straight defeats, and with the Ravens breathing down their necks, only a half-a-game out of first place in the AFC North, just as many people are worried about the Black and Gold making the playoffs at all, as they are about seeding. As for those worried about seeding, most have already accepted the reality of the No. 4 seed and a first-round rematch with the Chargers at Heinz Field. But while a one-and-a-half deficit in the standings with four weeks left is a rather large one to overcome, especially when you’re chasing two teams, it’s not totally impossible when you still have one of those teams remaining on your schedule. That team would be New England, who comes to town in less than two weeks for yet another mid-December showdown to determine AFC playoff positioning. Let’s say both the Steelers and Patriots hold serve this week (with Pittsburgh traveling to Oakland to take on a very bad Raiders team, holding serve is the only acceptable outcome), New England would arrive at Heinz Field with the same one-and-a-half game lead on December 16. If Pittsburgh can do something it hasn’t done in seven years and defeat the Patriots, that would obviously shrink the deficit down to one half of one game. From that point on, it’s a matter of New England stumbling one more time and the Steelers winning-out in-order to earn that third seed. You might say, “Big deal. What’s the difference between the third and fourth seed?” To that, I say, “There’s a big difference–at least this season.” Assuming everything stays the same–both the Chiefs and the Texans remain hot and lock up the first and second seed, respectively–the Steelers would take on the sixth seed in the wildcard round–the way things stand now, their opponent could be one of five contenders: the Ravens, Broncos, Titans, Colts or Dolphins. That’s a heck of a lot more attractive of an option than the prospect of Philip Rivers and Co. riding into town on a lightning bolt of confidence after storming back from a 16-point deficit to win the regular season match-up on December 2. Let the Patriots deal with the those red-hot and very-capable Chargers in the four vs. five wildcard match-up. If Pittsburgh handles its business in Round 1, it’s off to Houston to take on the Texans in Round 2. Yeah, sure, you’d have to face Deshaun Watson, J.J. Watt, DeAndre Hopkins and a bunch of other hungry Texans just chomping at the bit to make it to their first AFC title game. But while Watson is one of the NFL’s best young quarterbacks, while T.J. Watt‘s older brother is one of the game’s most feared defenders, while Hopkins would present a match-up nightmare for a secondary that often wakes up in a cold sweat, none of those guys are Tom Brady. I’d say a postseason route that includes taking on the last seed in the wildcard round and the Texans in the divisional round seems a lot more manageable than having to deal with a couple of future Hall of Fame quarterbacks….just to make it to the conference championship round. No, a number three seed isn’t nearly as coveted as a bye, but it isn’t chopped liver, either. As they try to hang on and win their third-straight AFC North title, it would be in the Steelers’ best interest to understand there really is a huge difference between a third seed and a fourth seed when it comes to mapping out a route for Super Bowl LIII. This entry was posted in Steelers 2018 Season and tagged Pittsburgh Steelers, T.J. Watt. Bookmark the permalink. Thanks. Yeah, going into the game there was hope galore for a lot of things. Now the Steelers will be lucky to make the playoffs. Huge win and even bigger hurdle overcome today vs the big bad Patriots proving this team when it wants to can achieve anything let’s remember we did this today without our #1 back. On to the most talented team in the league in the saints a win in the big easy would exhume this Steelers teams confidence to a season all time high then take care of business in season finale in Heinz and then its ride the peaking confidence wave all the way to Atlanta GO STEELERS !! Yes, it was a huge win.